Pioneer treks are a common summer activity for Church members around the world, allowing them to experience, if even partially, the challenges the earliest pioneers faced in searching for religious freedom in the 1800s. Opportunities abound to learn how suffering and sacrifice brings one close to the Savior. Walking in the pioneers’ footsteps, participants can feel empathy for those who heeded the call to gather to Zion. Rasmussen encourages every youth to participate in a trek, if possible. Youth in Mongolia reenact a pioneer trek. For many youth who would rather be at the movies or playing video games, leaving behind modern amenities may not exactly sound like fun. And when blisters and sore feet start setting in, attitudes can get even worse. When that happens, the charge to “do your duty with a heart full of song” becomes even greater for leaders (and any not afflicted with attitude-itis). “You’ve got to get into it!” says James Baird. “You want to have a super optimistic attitude. Kids are going to complain.” He was called after his mission to be a “pa,” who, along with a “ma,” was the leader of a “family” typically comprising around 10 youths. One trek activity may consist of 20 such groups. “You have to figure out how to be in a place where you can inspire them to keep going and to appreciate what they’re doing,” says Baird, who grew a beard and taught outdoor crafts to his trek family. A positive approach may even need to involve embracing square dancing. “We encourage them to learn how to do it [square dancing], as this was an important activity for the pioneers to rejuvenate them after long days on the trail,” says Elder Lorin Moench, the director of the Mormon Handcart Historic Sites of Wyoming, which encompasses about 100 miles of historic trails and locations and is the destination of about 25,000 trekkers each summer. He encourages trek participants to bring portable instruments such as harmonicas and violins to play at their campsites and along the trail. Phillip Millett’s attitude proved to be the most important thing he brought with him on trek. At age 19, he was older than what was usual, but because he had had so much fun at trek four years earlier, he contacted the stake president, trek leaders, and the stake Young Men president in order to be able to join. Eleven miles into the first 13 of the trek’s initial day, rain began to drizzle. After arriving at their camp that night, lightning prompted the families to seek shelter. Then sleet fell, with the temperature dropping 30 degrees in half an hour and biting air penetrating hundreds of teenagers. With some of the trekkers beginning to contract hypothermia, the stake president ordered them off the mountain. Ward members drove to the location to quickly shuttle the youths to safety. But Millett rose to the occasion, staying behind and loading other trekkers’ items into the vehicles. His effort proved to be crucial in helping some 200-plus people make it that night to a Heber barn owned by a ma and pa.
After the trek, a powerful testimony meeting was held in a stake youth sacrament meeting. When the stake Young Women president asked the self-described “tough guy” to share his feelings during the meeting, Millett soon found himself crying. The next week, Millett met with the stake president and began working on his mission papers. As youth embark on modern-day treks and, in some cases, walk in the same places where the early Saints walked more than a hundred years before, their testimonies can be strengthened by learning more about the pioneers whose lives they are reenacting. Youth can also gain a greater appreciation for the trials and faith of the pioneers by watching pioneer films such as the upcoming Trek: The Movie film, Ephraim's Rescue, and 17 Miracles at Mutual activities leading up to the trek. Keeping in mind the cause for which the early Saints were pushing forward can change the trek from a meander to a march. Baird prepared extensively to lead the youth in trek by studying and pondering the scriptures and reading ample amounts of pioneer stories, considering how to share the experiences of his ancestors with his trek family along the trail and seeking counsel from the Spirit to understand how to direct his youth. “I had the opportunity to work with some kids who needed some extra help or extra attention, so I was really excited to make a difference—to help them grow and change,” he says. Pioneer treks range in mileage, but be ready to walk. A lot. A common suggestion is to take lengthy hikes and even runs to get in shape, so you can better enjoy the experience. Some days of marching can last as long as 13 miles, all while pulling handcarts over rough terrain. One of the most physically difficult but also most impactful experiences for many trekkers is the “women’s pull,” Moench says. 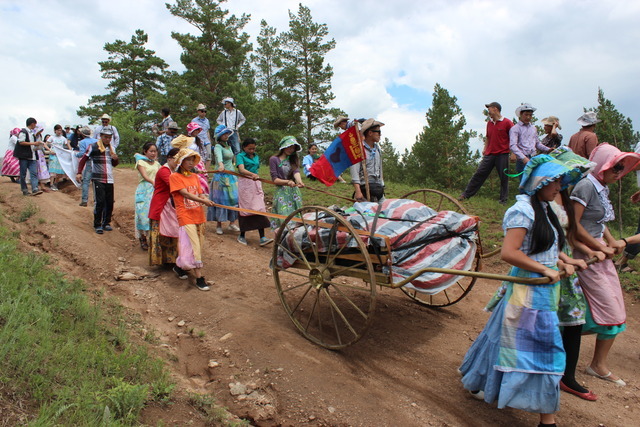 During that time, the men and boys are called away from the handcarts and taken by their leaders to the top of a hill, where they learn about their priesthood responsibilities toward the women in their lives. Meanwhile, the women are told about how any pioneer women lost their husbands along the way (or temporarily to the Mormon Battalion) and had to pull the handcarts to Zion by themselves. Then the women pull the handcarts up the hill while the men stand silently along each side of the road. “It is usually a very tender and emotional experience for all,” Moench says. For Baird’s family, the physical burden was huge, but the inner strength and connection it provided was as well. Among the three girls in his group pulling their handcart (along with the ma), one had shin splints and another was 12 years old—two years younger than the typical minimum age for participating in a trek. Once the team reached the top of the hill they had to conquer, the girl with shin splints collapsed. Baird carried her to a resting place immediately. Treks offer acquaintance with nature, hard work, and living outside—but without the right gear, it can sometimes be a frustrating experience. But one of the biggest supplies that can make a difference is your pioneer clothing. Rasmussen says the change in wardrobe (and leaving behind makeup and traditional fashion standards) helped her get in character. “A pocketful of beef jerky never hurts either,” Baird adds. Retailers like Zions Mercantile at Deseret Book provide bonnets, skirts, blouses, shirts, aprons, bandanas, suspenders, and satchels—and that’s just the clothing (pictured below). You can also find trek completion certificates, wristbands, neck coolers, journals, and dinnerware to make sure you’re fully prepared to have an immersive pioneer experience. A variety of pioneer clothing, journals, and mementos are available at Deseret Book. But regardless of what supplies participants bring on trek, the things they carry away are sure to be greater. To learn about safety guidelines or general trek information, visit lds.org andhandcarttreks.com.